3) Thirdly, devices that are neither offering a Web API directly, nor through a Cloud service (how dare they in 2014? ;-)). A good example would be all the not-so-smart devices that you have at home like your plain-old-lamps, fans, kettles, old-school-TVs, etc. Well, for those not all hope is lost: we can still make them smart at least at the basic level (on/off) without too much effort. For this we will hack an 433Mhz AM power-switch transmitter, no clue what this is? Well it is a set usually containing a remote control and a number of radio powered power-switches like the one in our collection. Then, thanks to the following tutorial we connect a $5 RF transmitter to an Arduino then connect these to a Raspberry Pi turning it into a 433Mhz RF remote control! We finally need to Web-enable this so that we can trigger the Raspberry PI “remote control” by means of REST calls. There are several ways of doing this like the very neat heimcontrol.js or the more featureful Webiopi. Regardless of which one you pick you should now be able to turn on and off literally any device connected to your RF power-sockets! Last but not least, the mashability comes into play: “How do you wire all these devices together in the same way that you would create Web Mashups?” Well this is where Physical Mashup editors come handy: they let you rewire your home visually! Let me introduce you to two of them: WoT-a-Mashup is a prototyping tool that lets you create your mashups in a snap, directly from your browser (currently only Firefox is supported). 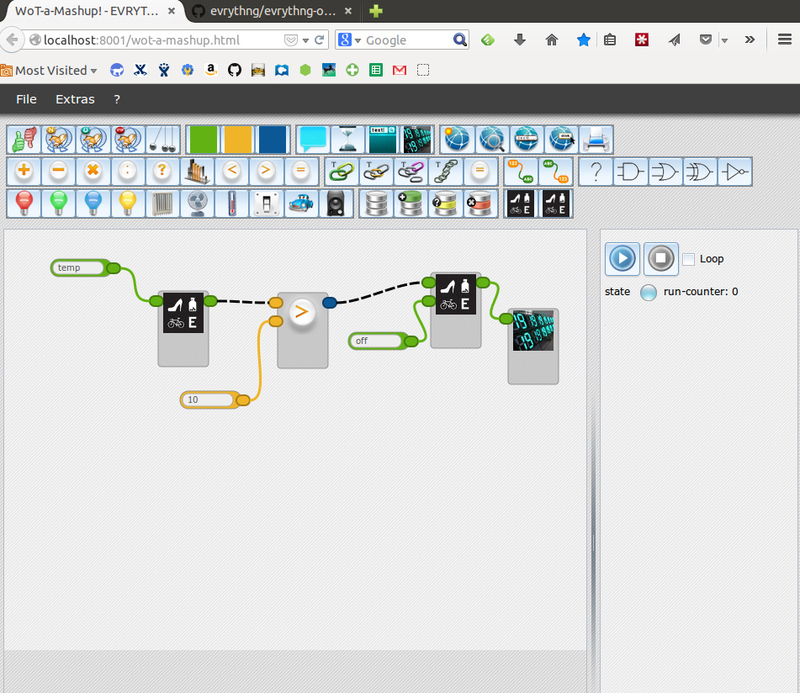 It is built on ClickScript, an IDE and great visual language designed to teach kids the art of programming, so it is quite easy to grasp. Basically each resource you want to integrate into your mashup (including the physical ones!) is a little box that accepts a number of inputs and has 0 or 1 output. We created two simple EVRYTHNG modules, one that lets you read a property of a Thng (see here) and one that lets you update the property of a Thng. Now, we can use these two simple modules and combine them with the default modules to create a workflow – workflow below is an example of combining modules. It fetches temperature data that you’ve pushed to the EVRYTHNG API. You can find code examples of how to do this with an OpenPicus Flyport (here) or an Arduino (here). Then, we check if the temperature is greater than 10; if it is, we send an off command to a device controlled by the EVRYTHNG API (e.g., a heater). We can also create the same type of workflow to include our Raspberry Pi remote controlled devices. All we need to do is to create our own mashup module. Let’s look at the code of the simple EVRYTHNG module I created as an example. This tool is great for quick-prototyping but because it runs your workflows in the browser, it isn’t really a viable option for long-running mashups and real-world use cases. This is when the great Node-RED enters the game! Node-RED provides a browser-based mashup editor that makes it easy to wire together flows using the wide range nodes in the palette, but it actually runs the mashups on Node.js which means that even when closing your browser they’ll still run! Node-RED is slightly more complicated to use than the Clickscript language, but it offers a lot more options and is truly tailored for the IoT. To interact with the EVRYTHNG API you could simply use the provided HTTP module, but to make it even easier, we created a Node-RED library for the EVRYTHNG API which you can download and install from here. Note that it currently only offers the option to read and update EVRYTHNG Properties, but we’ll add more features soon! 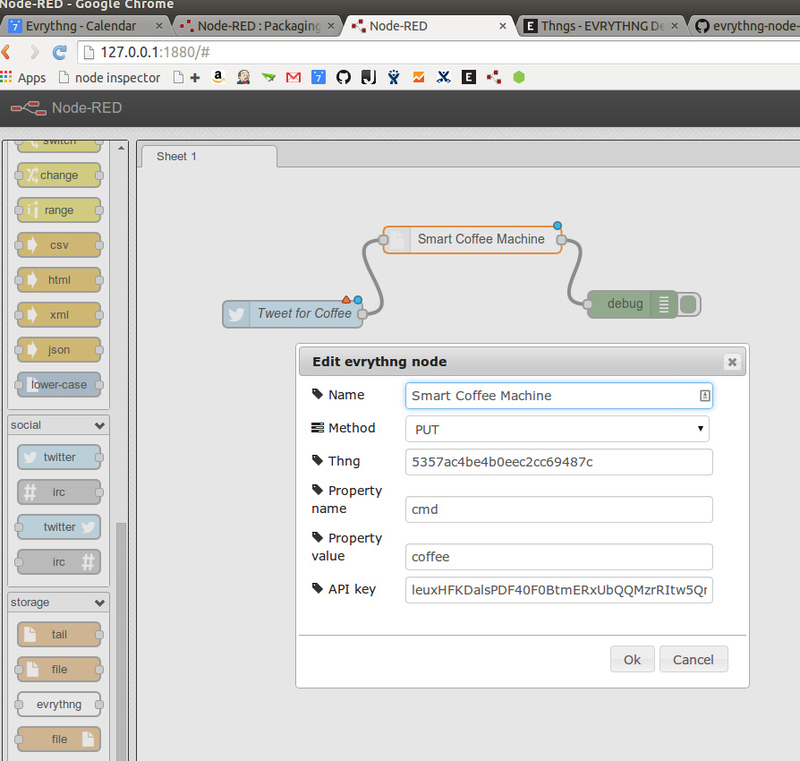 You can see a sample workflow below where we connected our EVRYTHNG-connected Smart Coffee Machine to Twitter so that if we send a tweet with a special hashtag, we get our favorite coffee served straight away! 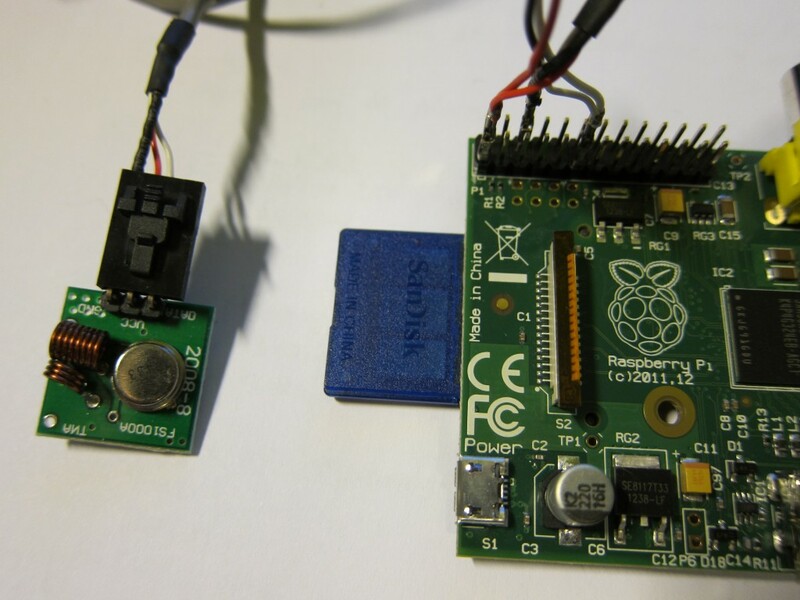 Adding our Raspberry Pi remote controlled devices is as easy as pi(e)! Indeed, because they are behind a REST API, all we need to do is to use the HTTP module to issue the REST calls. Finally, we need a place for our workflows to run. Fortunately, Node-RED runs can be installed on a Rasberry Pi as well (see here), so we can actually push it to our Pi where the workflows will be running until we terminate them. Here we go, we closed the loop and can now start rewiring our home, thanks to the Web of Things and Physical Mashups! seemingly no limit what can be connected to the Internet. The collection ebays shares for web of things is nice and helpful. Thanks.